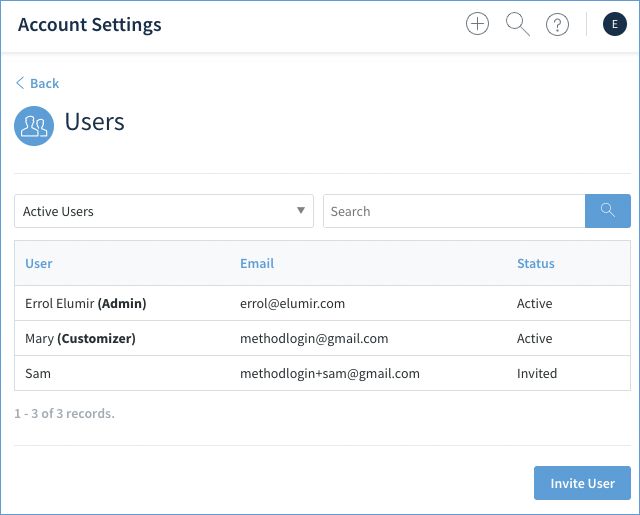 As an administrator, you can set up company preferences that will affect all users who log into your Method account. If you are interested in setting up your own personal preferences, please see the article Your Preferences. In this article, we will skip over the personal preferences and focus only on the company settings. Obviously, you cannot change any of these settings without administrative access. For information on apps that can integrate with Method, please see our article Accessing Method's Integrations. The company preferences are accessed by clicking the upper-right blue circle icon and then clicking Account Settings. 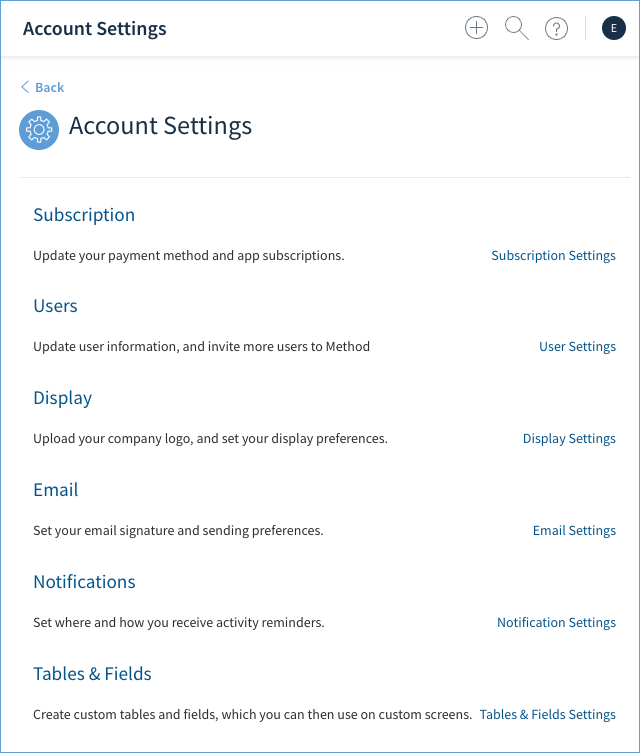 This will take you to your Account Settings menu where you will have access to a number of sections. Let's look at each one in detail below. 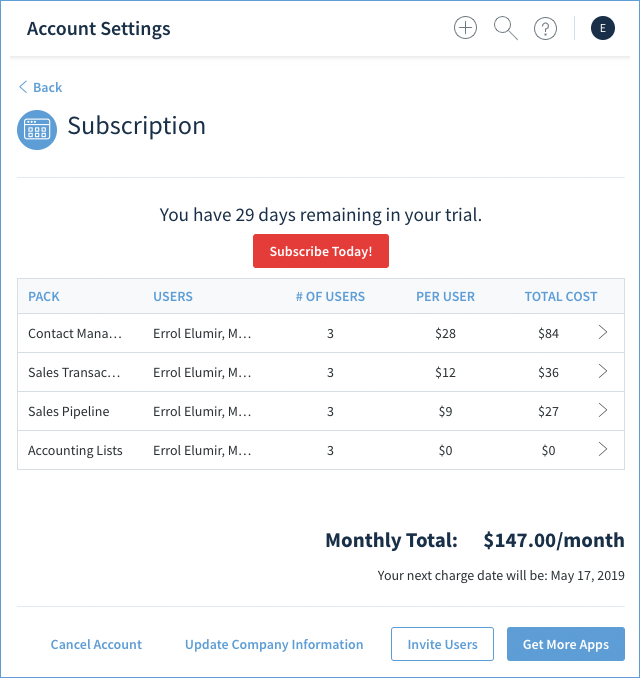 Subscribe Today: You will see the remaining days you have left in your trial. Selecting the button will take you to our payment page with frequently asked questions. Cancel Account: If you no longer need your, you can cancel it here. For more information, please see our article Cancelling Your Method Account. Update Company Information: This will take you to our Method Customer Portal where you can view your past invoices, cases, and update your company information. Invite Users: For more information on inviting users, please see our article Adding New Users. Get More Apps: For more information on adding new apps, please see our article Subscribing to Packs and Apps. You can also set the user permissions for each pack by selecting them in the grid. 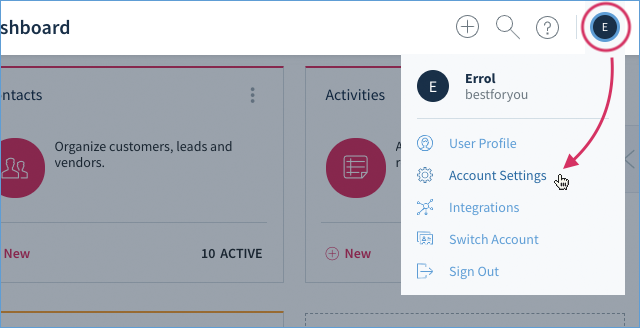 This section is for managing your all the users in your Method account. For more information, please check our articles on Setting Up Users. This section determines how Method will look to all users. It is divided into three sub-sections. For more information, please see our article Upload Your Company Logo. This is where you can choose your preferred date and time formats. These presets will determine how dates and times appear throughout Method. You can also choose whether or not to use a thousands separator (e.g. 1,000 vs. 1000). 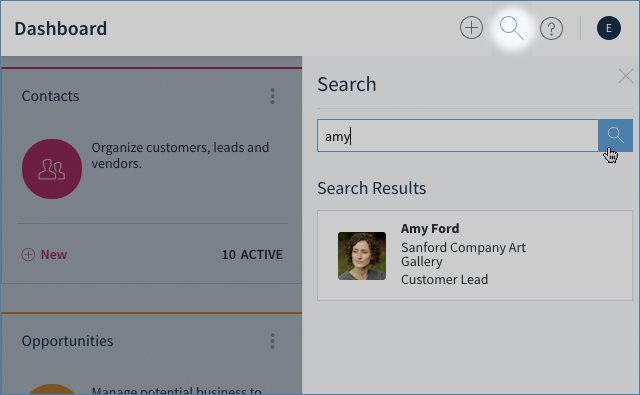 This enables the Contacts Search magnifying glass at the top of the screen. Please see our Dashboard article for more information. 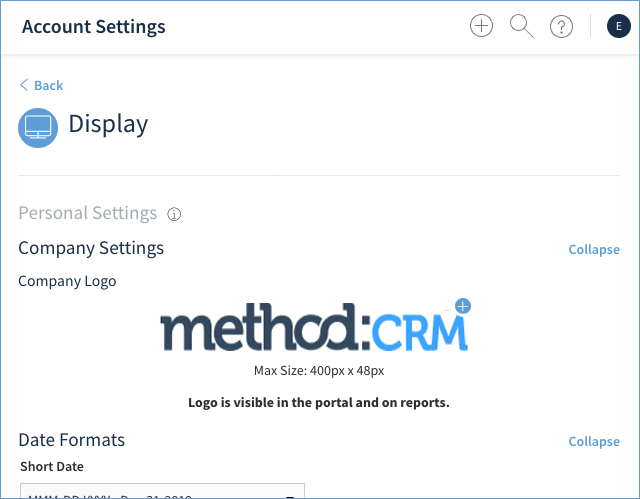 Method Labs is an option available for our users to try out new and upcoming features. For more information, please see our article What is Method Labs? This is where you can configure an email server if you choose not to use the one provided by Method. For more information, please see our article Set Up Your Email Server. 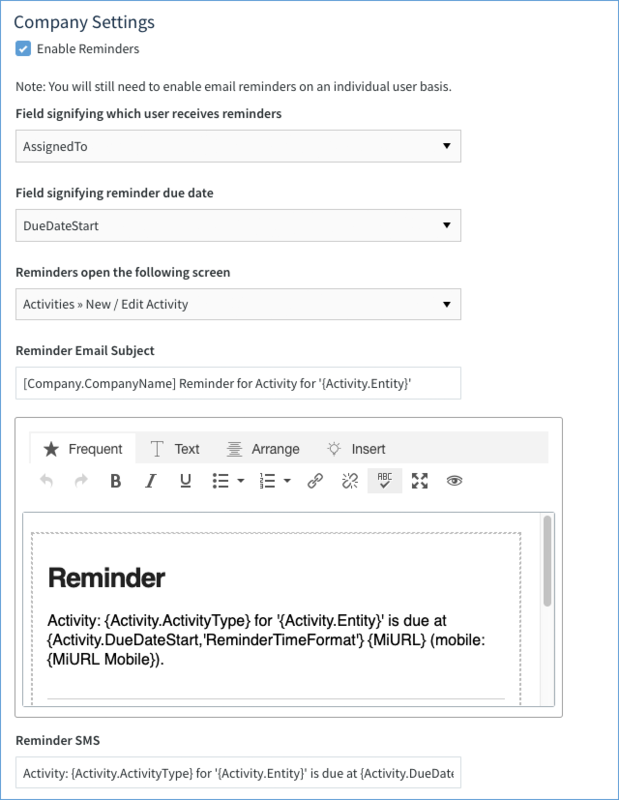 The Company section for Notifications lets you enable or disable the email reminders feature company-wide. (You will still have to enable email reminders on an individual user basis). Field signifying which user recieves reminders - This is in reference to the activities table. The default is the AssignedTo field. Field signifying reminder due date - This is in reference to the activities table. 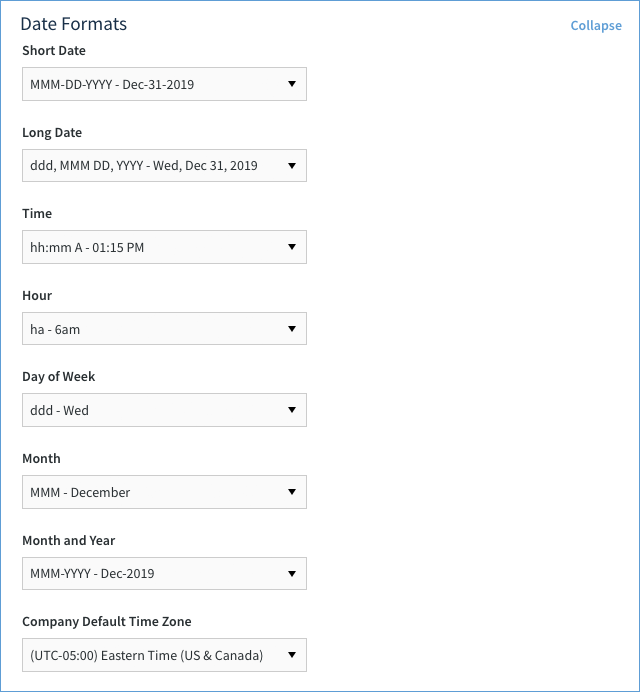 It specifies which one of the many date fields should be used as the due date reminder. The default is the DueDateStart field. Reminders open the following screen - In the reminder will be a url which will open directly the screen set here. The default is the New / Edit Activity screen. Remind Email Body - The email body which will bes ent out. NOTE: You can make changes to these settings, and to the body and subject of the email but it is not recommended since we’ve optimized this system to work efficiently out-of-the-box. Once you have enabled or disabled your reminders, click Save to save these new settings. 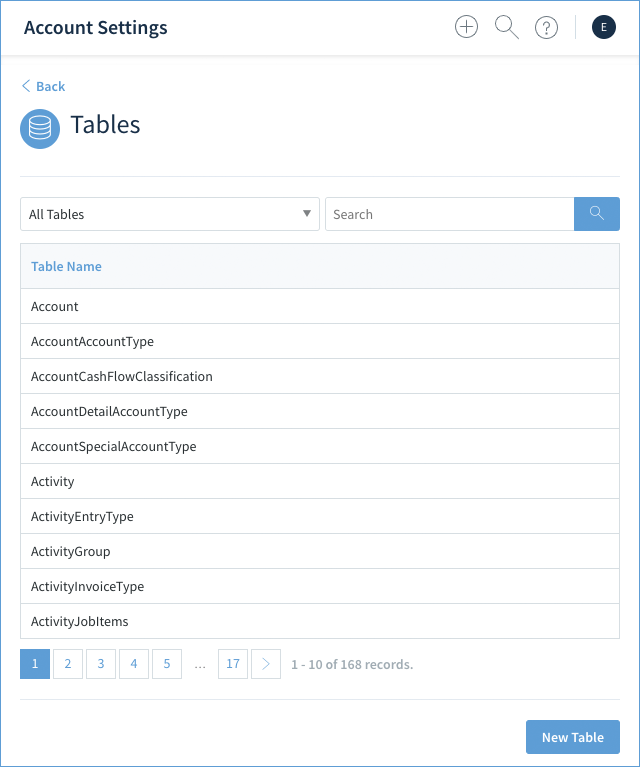 This section is for managing all the tables within your Method account. For experienced users of customization. For more information, please see our articles on customization.